Start time temperature in the mid-30s quickly gave way to a sun-filled sky and slight tailwind at the 25th annual 3M Half Marathon presented by Under Armour on Sunday, January 20th. Nearly 7500 participants registered, the most in event history, for the standalone half marathon. Participants traveled to Austin from 47 states and 13 countries. Memorable performances by thousands were highlighted by numerous PRs, an epic duel between the first and second place males, and a repeat female champion. The elite men provided an exciting race, with a pack of 4-5 running together most of the race. The sprint to the finish featured a dual. Texas State University alumnus Michael “Slim” Morris (1:07:19) crossed the finish line first. Oklahoma City’s Andrew Leahey (1:07:21) gave a hard final push and finished just two seconds after Morris. Monterrey, Mexico’s Ivan Ortiz (1:08:00) completed the overall men’s field. For the second year in a row, Matt McCurdy (1:11:55) was the male Master’s champion. Austinite Jessica Harper (1:14:23) was the female champion for the second time in as many years. Emily Parker of Kerrville, Texas, (1:19:00) and Anissa Angelosante of Ypsilanti, Michigan, (1:19:16) finishing second and third respectively. Tammy Bogle (1:27:57) was the top female Master’s finisher for the second year in a row. Despite chillier than normal temperatures, thousands of spectators lined the Austin streets. They cheered thousands on the point-to-point half marathon course. The course began in north Austin and finished near the Texas State Capitol. Some spectators hosted parties, played musical instruments, and handed out extracurricular nutrition and hydration. For those planning ahead to January 20, 2019, next year’s registration is open and set at the low price of $75. This amazing deal will be available until Wednesday, January 23rd. Don’t miss out on one of the faster half marathon courses in the country. It features the best packet in the industry, full of useful 3M products. Participants can see their results on the 3M Half Marathon website and continue to share their memorable experiences on Facebook, Twitter, and Instagram. Runners can expect their FinisherPix race day photos to be ready in 24-48 hours after the race. The 3M Half Marathon would like to thank the volunteers, spectators, and participants who made the race so special. This includes 3M’s Carl Wentzel, the 3M Half Marathon’s longest standing volunteer, and Austin Youth River Watch’s Executive Director Melinda Chow, the 3Mgives beneficiary. The following sponsors and partners made this successful race day possible: Under Armour, Fleet Feet Austin, Ascension Seton, SPIbelt, Austin Sports Commission, H-E-B, nuun hydration, Heavenly Care Moving, Dole, Oskar Blues Brewery, Goodwill Austin, Hilton, Camp Gladiator, Austin Massage Company, City of Austin, Austin Police Department, Department of Public Safety, CapMetro, and Travis County EMS. High Five Events welcomes Camp Gladiator (CG) as a supporting partner for the 2019 3M Half Marathon presented by Under Armour. CG will have an expo presence, lead the pre-race warm-up for participants, and energize athletes throughout the last mile at their hype station. 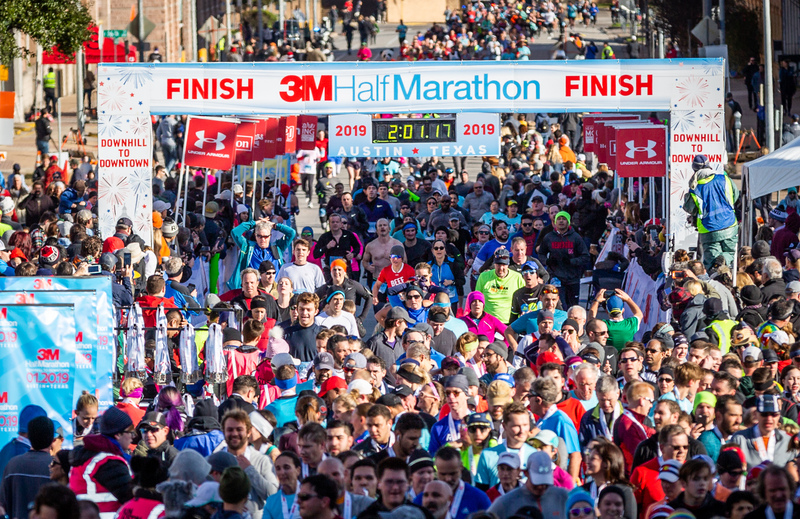 The 3M Half Marathon will take place on January 20, 2019. 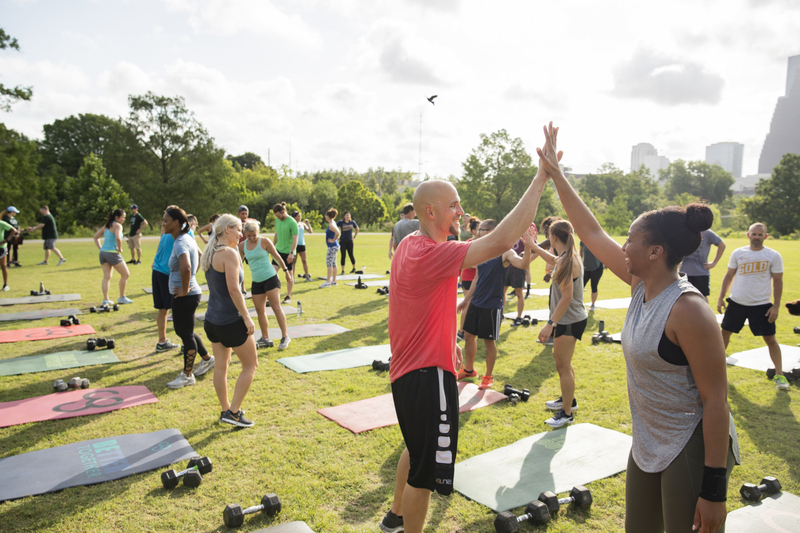 CG is an outdoor group fitness company whose mission is to positively impact the physical fitness and ultimately the lives of as many people as possible. They strive to be everywhere there are people and actively partner and engages at the community level to support, encourage and facilitate people of all athletic backgrounds in their long-term health and fitness pursuits. “CG and their trainers are excellent motivators and they’ll pump up participants race morning and give them an extra burst of energy during the final mile of the 3M Half Marathon,” said Jack Murray, co-owner of High Five Events. The 3M Half Marathon boasts one of the fastest 13.1-mile courses in the country. It will celebrate its 25th year running in 2019. Runners will enjoy a point-to-point course with mostly downhill running that showcases some of Austin’s finest locations. Starting in north Austin and finishing near the Texas State Capitol, runners will appreciate a 306’ net elevation drop. Registration is currently open for all options. High Five Events is making final preparations for the 25th annual 3M Half Marathon presented by Under Armour on January 20th. With registration numbers nearing 7500 participants, this will be the largest field in the event’s history. 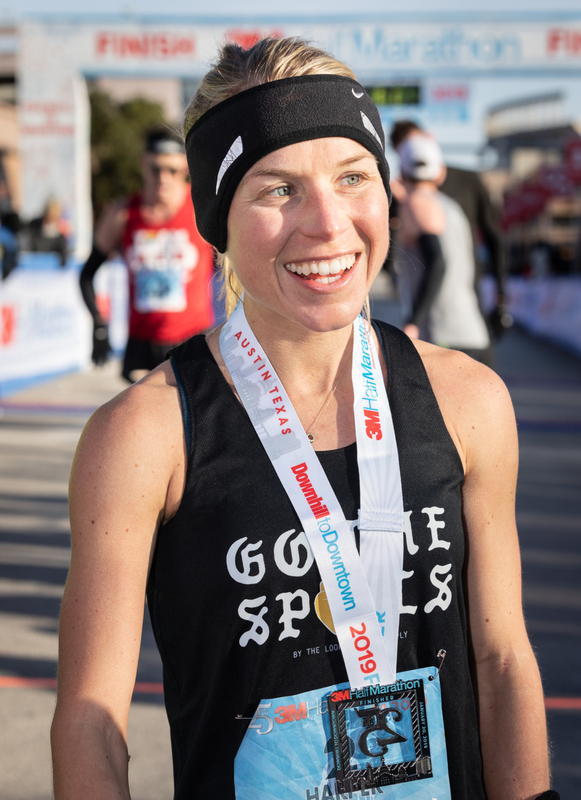 The race will begin at 7:30 a.m., feature a competitive elite field, benefit Austin Youth River Watch, and highlight thousands of runners chasing after their half marathon PR. Austin Youth River Watch is the beneficiary of the event. 3Mgives will contribute $60,000 to support Austin Youth River Watch’s educational programs in conjunction with the race. Austin Youth River Watch is a multi-year, after-school and summer program for high school students. They combine peer mentoring with intensive environmental education. Their students collect, analyze, and publish water-quality data from Austin-area streams and rivers. They then report their data to local and statewide agencies. Students also work with community partners on environmental restoration projects to improve watershed health. The 3M Half Marathon boasts one of the fastest 13.1-mile courses in the country. Runners enjoy a point-to-point course with mostly downhill running that showcases some of Austin’s finest locations. Starting in north Austin and finishing near the Texas State Capitol, runners will appreciate a 306’ net elevation drop. Registration is currently open for all options. High Five Events announces H-E-B will provide post-race snacks for participants of the 3M Half Marathon presented by Under Armour. H-E-B’s continued support ensures Texas’ favorite grocery store will refuel more than 7,500 participants. The 3M Half Marathon will take place on Jan. 20, 2019. The story of H‑E‑B begins more than 100 years ago in a small, family‑owned store in Kerrville, Texas. Today H‑E‑B serves families all over Texas and Mexico in 155 communities, with more than 340 stores and more than 100,000 employees. Their commitment to excellence has made them one of the nation’s largest independently owned food retailers. Their success hasn’t changed their commitment to exceptional service, low prices, and friendly shopping. 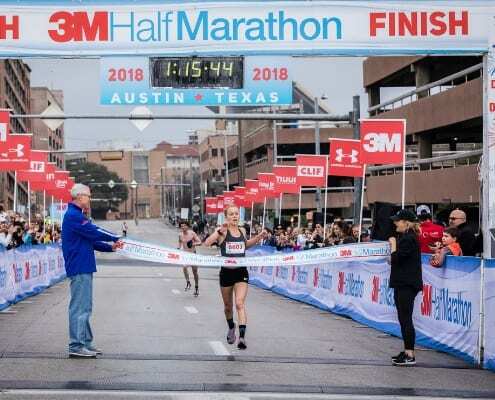 The 3M Half Marathon boasts one of the fastest 13.1-mile courses in the country and will celebrate its 25th year running in 2019. Runners will enjoy a point-to-point course with mostly downhill running that showcases some of Austin’s finest locations. Starting in north Austin and finishing near the Texas State Capitol, runners will appreciate a 306’ net elevation drop. Registration is currently open for all options. High Five Events names Ascension Seton as the Official Medical Provider for the 2019 3M Half Marathon presented by Under Armour. At the finish line medical tent, their experienced team will provide the best care available should participants need it. Similarly, they’ll have an on-course presence during the race. The 3M Half Marathon will take place on Jan. 20, 2019. As the Official Medical Provider, Ascension Seton doctors and nurses will staff the finish line medical tent and work with Travis County EMS on course. They will have a presence at the two-day expo. Ascension Seton is part of the largest nonprofit health system in the U.S. and the world’s largest Catholic health system. Under Armour, Inc. returns as the presenting sponsor of the 3M Half Marathon. The second-year partnership will highlight Under Armour’s support of the running community. It will also push runners to chase their personal edge on one of the country’s fastest half marathon courses. Under Armour will outfit participants and race volunteers with their HeatGear® running shirts. Additionally, Under Armour will outfit the 3M Half Marathon pace team with race kits. Pacers will lead runners to PRs in the newly-designed UA HOVR performance running footwear. Under Armour’s support will be felt by runners on race day in their quest to set a personal best. The 3M Half Marathon boasts one of the fastest 13.1-mile courses in the country. The standalone half marathon will celebrate its 25th year running on January 20, 2019. Runners will enjoy a point-to-point course with mostly downhill running that showcases some of Austin’s finest locations. Starting in north Austin and finishing near the Texas State Capitol, runners will appreciate a 300+’ net elevation drop. Registration is currently open.